There is a famous study of young children and the determining factors of their future success, called the marshmallow experiment. The subjects of this experiment are offered a choice of one marshmallow immediately, or two marshmallows after a few minutes. The findings reveal that one of the best determinants of a child's future is the ability to delay gratification. So, in general, the pre-schoolers who chose to eat the one marshmallow without delay, as a group, were less prosperous than the kids who chose the postponed, but greater, reward. My students just took their "Predictive" test, which is, as the name implies, a predictive measure of how the students are expected to perform on their yearly state assessment. My supervisor told me that she was taken aback by the results. I, on the other hand, was not at all surprised. The students who pay attention, do homework, and try the classwork, did well. Those who do nothing but talk, disrupt, and generally ruin their own and their classmates' education, did poorly. I didn't need a predictive to tell me this, nor do I need to wait for the results of the all-important state test to let me know who can perform on-level mathematically. There are always two groups in every class: the instant gratification crowd, and those that resist temptation. All students want to do well, and I think most, if not all, parents want their children to succeed. Not everyone knows how this can be accomplished, however. I tell my classes that it is up to them whether they will thrive in my class, and that the only ingredient in the success formula is effort. And, at the beginning of the year, everyone says they want to achieve good things and that they understand what that takes. But the school year is long, and new notebooks and good intentions give way to carelessness, laziness, and plain old-fashioned boredom. In this moment, it is far more interesting to pass a note about who we should be friends with than listen to my teacher talk about diameter and radius. Right now, I'd rather be texting than doing my homework. At this particular instant, I'd prefer to review with the kid next to me about last night's Modern Warfare game than try this problem about percent of a number. However, if I can manage to hold the long view, if I can suspend my current desires in an effort to better myself, which won't pay off until a future date, I will prosper. This, to me, is not at all ground-breaking news. 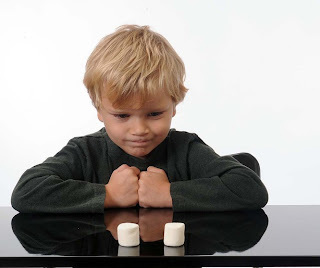 The good news about the marshmallow experiment is that children can be taught to suspend their immediate wants, and thus any child can do well. The bad news for teachers, especially secondary educators like me, is that this lesson is not one that can be easily taught by us. It comes down to parents of young children not giving into to their child's every whim and desire. It requires being a Tiger Mom and telling your precious little one that good enough isn't good enough, or that your baby needs to try harder and persevere even if things are no longer fun. Like everything else, the earlier it is taught, the more easily it is adopted. As a teacher, my anecdotal ratio of short-term vs. long-term minded students is 20 out of 30 middle schoolers. Trying to impress upon this amount of 11- to 13-year olds such a vital life lesson, in between my official math duties, is an impossible feat. I have had, in my nine years in the classroom, exactly one student who turned things around, and the parents, not I, take credit for this. For the rest of the 500 or so students I've been charged with, if they come through my doors in September not caring, there is nothing I can do to change their attitude. I know that this is not a great sound bite for the politicians, and there is no neat little quantifiable statistic. Nor is there any other way, that I know of, that this can be addressed by the education system. It is the responsibility of the parents. And no one wants to hear that.